The Indian Navy can trace its lineage back to the East India Company's Marine which was founded in 1612 to protect British merchant shipping in the region. In 1793 the East India Company established its rule over eastern part of the Indian subcontinent i.e. Bengal, but it wasn't until 1830 that the colonial navy became known as Her Majesty's Indian Navy. In 1858, East India Company rule gave way to the British Raj which lasted until India became independent in 1947. When India became a republic in 1950, the Royal Indian Navy as it had been named since 1934 was renamed to Indian Navy. The 17th-century Maratha emperor Chhatrapati Shivaji Maharaj is considered as the 'Father of the Indian Navy'. The primary objective of the navy is to secure the nation's maritime borders; India also uses its navy to enhance its international relations through joint exercises, port visits and humanitarian missions, including disaster relief. In recent years, the Indian Navy has undergone rapid modernisation to replace its ageing equipment currently in service, this is often seen as part of "India's drive" to develop blue-water capabilities and enhance its position in the Indian Ocean region. As of 2016, the Indian Navy has a strength of 79,023 personnel and a large operational fleet consisting of two aircraft carriers, one amphibious transport dock, 8 landing ship tanks, 11 destroyers, 14 frigates, one nuclear-powered attack submarine, one ballistic missile submarine, 13 conventionally-powered attack submarines, 24 corvettes, 6 mine countermeasure vessels, 27 patrol vessels, 4 fleet tankers and various other auxiliary vessels. India has a maritime history dating back 5,600 years. The first tidal dock is estimated to have been built at Lothal around 2300 BC during the Indus Valley Civilisation, near the present day Mangrol harbour on the Gujarat coast. The Rig Veda written around 1500 BC, credits Varuna with knowledge of the ocean routes and describes naval expeditions. There is reference to the side wings of a vessel called Plava, which give stability to the ship under storm conditions. A compass, the Matsya Yantra, was used for navigation in the fourth and fifth century AD. The earliest known reference to an organisation devoted to ships in ancient India is to the Mauryan Empire from the fourth century BCE. Emperor Chandragupta Maurya's Prime Minister Kautilya's Arthashastra devotes a full chapter on the state department of waterways under navadhyaksha (Sanskrit for Superintendent of ships) . The term, nava dvipantaragamanam (Sanskrit for sailing to other lands by ships, i.e. Exploration) appears in this book in addition to appearing in the Sanskrit text, Baudhayana Dharmasastra as the interpretation of the term, Samudrasamyanam. Sea lanes between India and neighbouring lands were the usual form of trade for many centuries, and are responsible for the widespread influence of Indian Culture on other societies. Powerful navies included those of the Chola dynasty, Maurya Empire, Satavahana, Gupta Empire, Pala, Pandya, Vijayanagara Empire, Kalinga, Mughal and Maratha Empire empires. 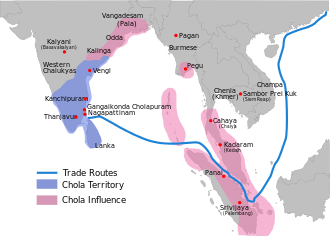 Particularly the Chola dynasty had a powerful navy which conquered parts of Maritime Southeast Asia and Sri Lanka in the 11th century during the reign of Raja Raja Chola I, Rajendra Chola I and Kulothunga Chola I. The Palas and the Chola]s excelled in foreign trade and maritime activity, extending their influence overseas to China and Southeast Asia. The Maratha naval power dominated the military scene in India for three centuries. During the 17th and 18th centuries, the Maratha and Kerala fleets were expanded, and became the most powerful Naval Forces in the subcontinent, defeating European Navies at various times (See the Battle of Colachel). The 'Pal' was a three masted fighter with guns peeping on the broadsides. Kanhoji Angre and Kunjali Marakkar, the Naval chief of Saamoothiri, were two notable naval chiefs of the period. In 1612, the English East India Company established the East India Company's Marine to protect its merchant shipping off the Gulf of Cambay and up the Narmada and Tapti rivers. Its first fighting ships in India were acquired on 5 September 1612. This force evolved into Her Majesty's Indian Navy in 1830, while parts of India was under British rule. The force at this time had British officers and Indian sailors. The Navy saw action in the First Opium War of 1840 and in the Second Anglo-Burmese War in 1852. During World War I, the force then known as the Royal Indian Marine undertook minesweeping, as well as supply and support operations for the Allies. Sub Lieutenant D. N. Mukherji was the first Indian to be granted a commission as an engineer officer in 1928. In 1934, the navy was renamed as the Royal Indian Navy (RIN). At the start of the Second World War, the tiny Royal Indian Navy consisted of five sloops, one survey vessel, one depot ship, one patrol vessel and numerous assorted small craft; personnel strength was at only 114 officers and 1,732 sailors. The onset of war led to an expansion in numbers of vessels and personnel. By June 1940, the navy had doubled its number of personnel and expanded to nearly six times its pre-war strength by 1942. The navy was actively involved in operations during the war around the world. Its sloops HMIS Sutlej and HMIS Jumna played a key role in Operation Husky, the Allied invasion of Sicily. It was heavily involved in operations around the Indian Ocean, including convoy escorts, mine-sweeping, supply, as well as supporting amphibious assaults. When hostilities ceased in August 1945, the Royal Indian Navy had expanded by over ten times to a personnel strength of over 25,000 officers and sailors. Its fleet at the end of the war comprised seven sloops, four frigates, four corvettes, 14 minesweepers, 16 trawlers, two depot ships, 30 auxiliary vessels, 150 landing craft, 200 harbour craft and several motor launches. The RIN suffered 275 casualties during the conflict: 27 officers, two warrant officers and 105 ratings killed in action, two ratings missing in action and a further 14 officers, two warrant officers and 123 ratings wounded. For their valiant role in the war, the officers and ratings of the RIN received amongst them the following honours and decorations: a KBE (Mil. ), a knighthood, a CB (Mil. ), 10 CIEs, two DSOs, a CBE, 15 DSCs, an OBE, 28 DSMs, eight OBIs, two IOMs, 16 BEMs, 10 Indian Defence Service Medals, a Royal Humane Society Medal, 105 mentions in dispatches and 118 assorted commendations. Immediately after the war, the navy underwent a rapid, large-scale demobilisation of vessels and personnel. In 1946, Indian sailors started the Royal Indian Navy mutiny, a rebellion influenced by activities of Indian National Army and post-Second World War political unrest in India on board ships and on shore establishments to protest discrimination against Indian officers and sailors by the British and the putting on trial of ex-Indian National Army soldiers and officers. A total of 78 ships, 20 shore establishments and 20,000 sailors were involved in the rebellion, which spread all over India. This rebellion failed as the rebels did not receive support from the political leaders. After the independence of India on 15 August 1947 and the ensuing partition, the RIN's depleted fleet of ships and remaining personnel were divided between the newly independent Union of India and Dominion of Pakistan. When India became a republic on 26 January 1950, the Royal prefix was dropped and the name Indian Navy was officially adopted. The prefix for naval vessels was changed to Indian Naval Ship (INS). During the early years following independence, the navy still had many British officers who continued to serve with the Indian Navy. Vice Admiral Ram Dass Katari was the first Indian to assume office as the Chief of Staff of the Indian Navy on 22 April 1958. The first engagement in action of the Indian Navy was against the Portuguese Navy during the liberation of Goa in 1961. Operation Vijay followed years of escalating tension due to Portuguese refusal to relinquish its colonies in India. On 21 November 1961, Portuguese troops fired on the passenger liner Sabarmati near Anjadip Island, killing one person and injuring another. During Operation Vijay, the Indian Navy supported troop landings and provided fire support. The cruiser INS Delhi sank one Portuguese patrol boat, while frigates INS Betwa and INS Beas destroyed the Portuguese frigate NRP Afonso de Albuquerque. The 1962 Sino-Indian War was largely fought over the Himalayas and the Navy had only a defensive role in the war. Indian Naval activity in the Indo-Pakistani War of 1965 largely involved coastal patrols. During the war, the Pakistani Navy attacked the Indian coastal city of Dwarka, although there were no military resources in the area. While this attack was insignificant, India deployed naval resources to patrol the coast and deter further bombardment. Following these wars in the 1960s, India resolved to strengthen the profile and capabilities of its Armed Forces. The dramatic change in the Indian Navy's capabilities and stance was emphatically demonstrated during the Indo-Pakistani War of 1971. Under the command of Admiral Sardarilal Mathradas Nanda, the navy successfully enforced a naval blockade of West and East Pakistan. 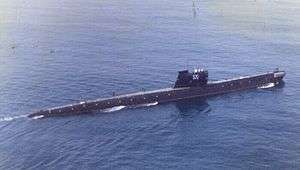 Pakistan's lone long-range submarine PNS Ghazi was sunk following an attack by the destroyer INS Rajput off the coast of Visakhapatnam around midnight of 3–4 December 1971. On 4 December, the Indian Navy successfully executed Operation Trident, a devastating attack on the Pakistan Naval Headquarters of Karachi that sank a minesweeper, a destroyer and an ammunition supply ship. The attack also irreparably damaged another destroyer and oil storage tanks at the Karachi port. To commemorate this, 4 December is celebrated as the Navy Day. This was followed by Operation Python on 8 December 1971, further deprecating the Pakistan Navy's capabilities. Indian frigate INS Khukri, commanded by Captain M. N. Mulla was sunk by PNS Hangor, while INS Kirpan was damaged on the west coast. In the Bay of Bengal, the aircraft carrier INS Vikrant was deployed to successfully enforce the naval blockade on East Pakistan. Sea Hawk and the Alizé aircraft from INS Vikrant sank numerous gunboats and Pakistani merchant marine ships. To demonstrate its solidarity as an ally of Pakistan, the United States sent Task Force 74 centred around the aircraft carrier USS Enterprise into the Bay of Bengal. In retaliation, Soviet Navy submarines trailed the American task force, which moved away from the Indian Ocean towards Southeast Asia to avert a confrontation. In the end, the Indian naval blockade of Pakistan choked off the supply of reinforcements to the Pakistani forces, which proved to be decisive in the overwhelming defeat of Pakistan. The Indian Navy was a part of the joint forces exercises, Operation Parakram, during the 2001–2002 India–Pakistan standoff. More than a dozen warships were deployed to the northern Arabian Sea. In 2001, the Indian Navy took over operations to secure the Strait of Malacca, to relieve US Navy resources for Operation Enduring Freedom. The navy plays an important role in providing humanitarian relief in times of natural disasters, including floods, cyclones and tsunamis. In the aftermath of the 2004 Indian Ocean earthquake and tsunami, the Indian Navy launched massive disaster relief operations to help affected Indian states as well as Maldives, Sri Lanka and Indonesia. Over 27 ships, dozens of helicopters, at least six fixed-wing aircraft and over 5000 personnel of the navy were deployed in relief operations. These included Operation Madad in Andhra Pradesh and Tamil Nadu, Operation Sea Waves in the Andaman and Nicobar Islands, Operation Castor in Maldives, Operation Rainbow in Sri Lanka and Operation Gambhir in Indonesia. This was one of the largest and fastest force mobilisations that the Indian Navy has undertaken. Indian naval rescue vessels and teams reached neighbouring countries less than 12 hours from the time that the tsunami hit. Lessons from the response led to decision to enhance amphibious force capabilities, including the acquisition of landing platform docks such as INS Jalashwa, as well as smaller amphibious vessels. During the 2006 Israel-Lebanon conflict, the Indian Navy launched Operation Sukoon to evacuate 2,286 Indian nationals and expatriates, besides 436 Sri Lankan and 69 Nepali citizens, from war-torn Lebanon. In 2006, Indian naval doctors served for 102 days on board USNS Mercy to conduct medical camps in the Philippines, Bangladesh, Indonesia and East Timor. In 2007, Indian Navy supported relief operations for the survivors of Cyclone Sidr in Bangladesh. In 2008, Indian Naval vessels were the first to launch international relief operations for victims of Cyclone Nargis in Myanmar. In 2011, the Indian Navy launched Operation Safe Homecoming and rescued Indian nationals from war torn Libya. During the 2015 crisis in Yemen, the Indian Navy was part of Operation Raahat and rescued 3074 individuals out of which 1291 were foreign nationals. In October 1999, a coordinated effort by the Indian Navy and the Indian Coast Guard led to the rescue of pirated Japanese cargo ship, MV Alondra Rainbow. In 2008, the navy deployed INS Tabar and INS Mysore into the Gulf of Aden to combat piracy in Somalia. Tabar prevented numerous piracy attempts, and escorted hundreds of ships safely through the pirate-infested waters. The navy also undertook anti-piracy patrols near the Seychelles, upon that country's request. In 2011, the navy launched Operation Island Watch to deter piracy attempts by Somali pirates off the Lakshadweep archipelago. This operation has had numerous successes in preventing pirate attacks. On 14 August 2013, the submarine INS Sindhurakshak sank in Bombay Dockyard due to explosions aboard. On 16 November 2013, the then Defence Minister A.K. Antony commissioned a modified Kiev-class aircraft carrier INS Vikramaditya in Severodvinsk, Russia. On 15 April 2016, a Poseidon-8I long-range patrol aircraft managed to thwart a piracy attack on the high seas by flying over MV Sezai Selaha, a merchant vessel, which was being targeted by a pirate mother ship and two skiffs around 800 nautical miles (1,500 km; 920 mi) from Mumbai. The Commander of the Navy is the Chief of Naval Staff (CNS), who holds the rank of Admiral. While the provision for the rank of Admiral of the Fleet exists, it is primarily intended for major wartime use and honour. No officer of the Indian Navy has yet been conferred this rank. The CNS is assisted in his role as commander of the Navy by the Vice Chief of Naval Staff (VCNS), a vice-admiral; the CNS also heads the Integrated Headquarters (IHQ) of the Ministry of Defence (Navy), based in New Delhi. The Deputy Chief of Naval Staff (DCNS), a vice-admiral, is the assistant head of the IHQ, and is a Principal Staff Officer, along with the Chief of Personnel (COP) and the Chief of Materiel (COM), both of whom are also vice-admirals. The Director General Medical Services (Navy) is a Surgeon Vice-Admiral. The Indian Navy operates three Commands. Each Command is headed by a Flag Officer Commanding-in-Chief of the rank of Vice Admiral. The Eastern and Western Commands each have a Fleet commanded by a rear admiral, and each also have a Commodore commanding submarines. The Southern Naval Command is home to the Flag Officer Sea Training. Additionally, the Andaman and Nicobar Command headquartered at Port Blair is a unified tri-services command under the Commander in Chief Andaman and Nicobar (CINCAN) who reports to the Chairman Chiefs of Staff Committee (COSC) who is provided staff support by the Chief of Integrated Staff to the Chiefs of Staff Committee (CISC) in New Delhi. The Andaman and Nicobar Command, a unified Indian Navy, Indian Army Indian Air Force and Coast Guard Command was set up in the Andaman and Nicobar Islands in 2001. Indian Navy has its major operational bases in Visakhapatnam, Mumbai, Kochi and Chennai. In 2005, the Indian Navy commissioned INS Kadamba at Karwar, 100 kilometres (62 mi) from Goa. The base is the first to be controlled exclusively by the Navy without sharing port facilities with commercial shipping. Built under phase I of the Project Seabird, it is the largest naval base in the region. The Indian Navy also has berthing rights in Oman and Vietnam. The navy operates INS Kattabomman, a VLF and ELF transmission facility at Vijayanarayanapuram near Tirunelveli in Tamil Nadu. The Navy operates a monitoring station, fitted with radars and surveillance gear to intercept maritime communication, in Madagascar. It also plans to build a further 32 radar stations in Seychelles, Mauritius, Maldives and Sri Lanka. According to Intelligence Online published by France-based global intelligence gathering organisation, Indigo Publications, the Navy is believed to be operating a listening post in Ras al-Hadd, Oman. The post is located directly across from Gwadar Port in Balochistan, Pakistan, separated by approximately 400 kilometres (250 mi) of the Arabian Sea. INS Vajrakosh, commissioned on 9 September 2015, is the latest establishment of the Indian Navy at Karwar, Karnataka which will serve as special storage facility for specialised armaments and missiles. INS Vajrakosh will have all the required infrastructure and will be manned by specialists to provide specialised servicing facilities for these sophisticated missiles and ammunition. Officer training is conducted at Indian Naval Academy at Ezhimala, on the coast of Kerala. Established in 2009, it is the largest naval academy in Asia. As of 2016, the Indian Navy has a sanctioned strength of 11,384 officers and 67,639 enlisted personnel. There was a shortage of 1518 officers with 9866 officers serving and a shortage 9640 enlisted personnel with 57,999 serving. This is inclusive of 7,000 Naval Aviation, 2,000 Marine commandos and 1,000 Sagar Prahari Bal soldiers. The naval air-arm is an important component of the Indian Navy. The air arm consists of MiG-29K jets that operate from the aircraft carrier INS Vikramaditya and helicopters operating from Vikramaditya and INS Viraat. The Kamov-31 operates from the aircraft carriers and provides the airborne early warning cover for the fleet. In the anti-submarine role the Sea King, Ka-28 and the domestic built HAL Dhruv are used. The MARCOS also use Sea King and HAL Dhruv helicopters while conducting operations. Maritime patrol and reconnaissance operations are carried out by the Boeing P-8 Poseidon, the Tupolev 142 and the Ilyushin 38. The UAV arm consists of the IAI Heron and Searcher-IIs that are operated from both surface ships and shore establishments for surveillance missions. The Indian Navy also maintains a four-aircraft aerobatic display team, the Sagar Pawan. The Sagar Pawan team will be replacing their present Kiran HJT-16 aircraft with the newly developed HJT-36 aircraft. The southernmost naval air station, INS Bazz was formally opened on 31 July 2012 by the Indian Navy Chief at Cambell Bay in Andaman and Nicobar Islands. With the commissioning of this station, the country acquired increased capability to keep vigil on the vital maritime channel of the Straits of Malacca. The Marine Commando Force (MCF), also known as MARCOS, is a special forces unit that was raised by the Indian Navy in 1987 for direct action, special reconnaissance, amphibious warfare and counter-terrorism. In 1988, the MARCOS successfully rescued several hostages, including Maldives' then-Minister of Tourism, aboard a ship hijacked by PLOTE mercenaries during Operation Cactus. 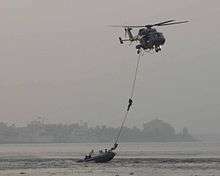 The MARCOS are typically deployed to prevent infiltration through the Jhelum River and Wular Lake and are also involved in covert counter-terrorism operations in and around lakes and rivers in Jammu and Kashmir. During the 26/11 Mumbai attacks, the MARCOS were also involved in the rescue mission of hostages captured by the terrorists in Taj Mahal Palace & Tower luxury hotel in Mumbai as part of a large terrorist attack in Mumbai metropolis in November 2008. The names of all in service ships (and Naval Bases) of the Indian Navy are prefixed with the letters INS, designating Indian Naval Ship or Indian Navy Station. The fleet of the Indian Navy is a mixture of domestic built and foreign vessels. The Indian Navy presently has two aircraft carriers in active service, INS Viraat and INS Vikramaditya. Viraat is planned for decommissioning after the induction of the first domestically built Vikrant-class aircraft carrier. In 2004, India bought the Russian aircraft carrier, Admiral Gorshkov for the equivalent of US$974 million. It cost an additional US$1.326 billion to overhaul the vessel and refit it entirely with new electronic, weapon systems and sensors, bringing the total procurement cost to USD 2.3 billion. INS Vikramaditya sailed to India after her commissioning on 15 November 2013. It joined active service by December 2013. The Indian Navy has an amphibious transport dock of the Austin class, re-christened as INS Jalashwa in Indian service. It also maintains a fleet of landing ship tanks. It is expected that four more amphibious transport docks will be constructed in the future. INS Kamorta, on International Yoga day. In addition to destroyers, the navy operates several classes of frigates such as three Shivalik (Project 17 class) and six Talwar-class frigates. Seven additional Shivalik-class frigates (Project 17A class frigates) are on order. The older Godavari-class frigates will systematically be replaced one by one as the new classes of frigates are brought into service over the next decade. The last remaining Nilgiri-class frigate was decommissioned on 27 June 2013. Smaller littoral zone combatants in service are in the form of corvettes, of which the Indian Navy operates the Kamorta,Kora, Khukri, Veer and Abhay-class corvettes. Replenishment tankers such as the Jyoti-class tanker, INS Aditya and the new Deepak-class fleet tanker- help improve the navy's endurance at sea. The Deepak-class tankers will be the mainstay of the replenishment fleet until the first half of the 21st century. The Indian Navy operates two types of conventional attack submarines; the Sindhughosh (Russian Kilo-class submarine design) and the Shishumar (German Type 209/1500 design) classes. India also possesses a single Akula-class nuclear-powered attack submarine named INS Chakra. She is the result of a US$2 billion deal between India and Russia for the completion and lease of two Akula-class submarines to the Indian Navy. Three hundred Indian Navy personnel were trained in Russia for the operation of these submarines. Negotiations are on with Russia for the lease of the second Akula-class submarine. At the end of the lease, it has been agreed that India will have the option to purchase the submarines outright. Arihant, was launched on 26 July 2009 in Visakhapatnam (India). she was secretly commissioned into active service in August 2016. The Navy plans to have six nuclear-powered ballistic missile submarines in service in the near future. She is both the first boat of the Arihant-class nuclear-powered ballistic missile submarines and the first nuclear-powered submarine to be built in India. India has a number of foreign made cruise missile systems, including the Klub SS-N-27. It also has its own Nirbhay cruise missile systems under development. Another successful programme has been the adaptation of the Yakhont anti-ship missile system into the BrahMos by the NPO and the Defence Research and Development Organisation (DRDO). The BrahMos has been tailored to Indian needs and uses a large proportion of Indian-designed components and technology, including its fire control systems, transporter erector launchers, and its onboard navigational attack systems. The successful test of Brahmos from INS Rajput provides Indian Navy with precision land attack capability. India has also fitted its P-8I Neptune reconnaissance aircraft with all-weather, active-radar-homing, over-the-horizon AGM-84L Harpoon Block II missiles and Mk 54 All-Up-Round Lightweight Torpedoes. 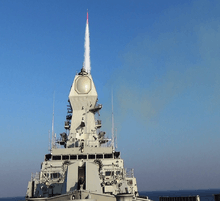 Indian warships' primary air-defence shield is provided by Barak 1 surface-to-air missile while an advanced version Barak 8 is in development with join collaboration with Israel. India's next-generation Scorpène-class submarines will be armed with Exocet anti-ship missile system. Among indigenous missiles, ship-launched version of Prithvi-II is called Dhanush, which has a range of 350 kilometres (220 mi) and can carry nuclear warheads. The K-15 Sagarika (Oceanic) submarine-launched ballistic missile (SLBM), which has a range of at least 700 km (some sources claim 1000 km) forms part of India's nuclear triad and is extensively tested to be integrated with the Arihant class of nuclear submarines. A longer range submarine launched ballistic missile called K-4 is under testing, to be followed by K-5 SLBM. Sangraha is a joint electronic warfare programme of the Defence Research and Development Organisation (DRDO) and the Indian Navy. The system comprises a family of electronic warfare suites, such as Ajanta and Ellora, for use on different naval platforms capable of intercepting, detecting, and classifying pulsed, carrier wave, pulse repetition frequency agile, frequency agile and chirp radars. The systems employ a modular approach facilitating deployment on various platforms like helicopters, vehicles, and small ships. Certain platforms, apart from ESM (electronic support measures), have ECM (electronic countermeasure) capabilities. Advanced technologies like multiple-beam phased array jammers are employed in the system for simultaneous handling of multiple threats. The Indian Navy also relies on information technology to face the challenges of the 21st century. The Indian Navy is implementing a new strategy to move from a platform centric force to a network-centric force by linking all shore-based installations and ships via high-speed data networks and satellites. This will help in increased operational awareness. The network is referred to as the Navy Enterprise Wide Network (NEWN). The Indian Navy has also provided training to all its personnel in Information Technology (IT) at the Naval Institute of Computer Applications (NICA) located in Mumbai. Information technology is also used to provide better training, like the usage of simulators and for better management of the force. With increasing cyber terrorism and attacks on its networks, the navy has created a separate cell for communications, space and network centric operations (CS&NCO) under an officer of the rank of Rear Admiral. The cell would operate and maintain the naval network and will respond to cyber attacks from hostile hackers. It will be manned by a special information technology cadre of the Indian Navy. India's first exclusive defence satellite GSAT-7 was successfully launched by European space consortium Arianespace's Ariane 5 rocket from Kourou spaceport in French Guiana in August 2013, giving a major push to the country's maritime security. The Navy is the user of the multi-band home-built communication spacecraft, which has been operational since September 2013. GSAT-7 was designed and developed by the Indian Space Research Organisation (ISRO) and is expected to operate for seven years in its orbital slot at 74 degrees east, providing UHF, S-band, C-band and Ku-band relay capacity. Its Ku-band capacity is expected to provide high-density data transmission facility, both for voice and video. This satellite has been provided with additional power to communicate with smaller and mobile (not necessarily land-based) terminals. This dedicated satellite is expected to provide the Indian navy with an approximately 3,500- to 4,000-kilometer footprint over the Indian Ocean region, and over both the Arabian Sea and the Bay of Bengal region and enable real-time networking of all its operational assets in the water (and land). It also will help the navy to operate in a network-centric atmosphere. The President of India is entitled to inspect his/her fleet, as he/she is the supreme commander of the Indian Armed Forces. The first president's fleet review by India was hosted by Dr. Rajendra Prasad on 10 October 1953. President's reviews usually take place once in the President's term. In all, ten fleet reviews have taken place, including in February 2006, when former president Dr. APJ Abdul Kalam took the review. The latest, on 20 December 2011, when President Pratibha Patil set sail in INS Subhadra to take the 10th Fleet Review. The Indian Navy also conducted an International fleet review named Bridges of Friendship in February 2001 in Mumbai. Many ships of friendly Navies from all around the world participated, including two from the US Navy. The International Fleet Review 2016 was held off Visakhapatnam coast in February 2016 where Indian Navy's focus was on improving diplomatic relations and military compatibility with other nations. India often conducts naval exercises with other friendly countries designed to increase naval interoperability and also to strengthen cooperative security relationship. Some such exercises take place annually like the Varuna with the French Navy, Konkan with the Royal Navy, Indra with Russian Navy, Malabar with the US Navy, Simbex with the Republic of Singapore Navy and IBSAMAR with the Brazil and South African navies. The Indian Navy also conducted exercise with the People's Liberation Army Navy in 2003 and will send ships to the South China Sea to participate in the fleet review. Apart from the Indian Ocean, India has steadily gained influence in the Pacific Ocean. In 2007, Indian Navy conducted naval exercise with Japan Maritime Self-Defence Force and U.S Navy in the Pacific and also signed an agreement with Japan in October 2008 for joint naval patrolling in the Asia-Pacific region. India has also held naval exercise with Vietnam, Philippines and New Zealand. In 2007, India and South Korea decided to conduct annual naval exercise and India participated in the South Korean international fleet review. In addition, Indian Navy will also be increasing naval co-operation with other allies, particularly with Germany and Arab states of the Persian Gulf including Kuwait, Oman, Bahrain and Saudi Arabia. India held the first Indian Ocean Naval Symposium (IONS) with an objective to provide a forum for all the littoral nations of the Indian Ocean to co-operate on mutually agreed areas for better security in the region. The Indian Navy is increasingly used in international diplomacy. Since 2000, the Indian naval ships have made port calls in Israel, Turkey, Egypt, Libya, Greece, Thailand, Indonesia, Australia, New Zealand, Tonga, South Africa, Kenya, Qatar, Oman, United Arab Emirates, Bahrain, Kuwait and other countries in 2005–2007. The first Atlantic Ocean deployment of the Indian Navy happened in 2009. During this deployment, the Indian Naval fleet conducted exercises with the French, German, Russian and British Navies. In 2007, the TROPEX (Theatre-level Readiness Operational Exercises) was held during which Indian Navy experimented the doctrine of influencing a land and air battle to support the Indian Army and the Indian Air Force. Tropex 2010 was held, with the Western and Eastern fleets taking part along with elements from the airforce. In 2010, Indian naval warships were deployed in the Asia pacific region, and conducted courtesy calls at friendly ports. Recently, Indian Navy carried out a Joint Naval exercise with Sri Lanka Navy codenamed SLINEX-II from 19 to 24 September 2011. The exercise was aimed at increasing the capabilities of the two nations in carrying out anti-piracy operations and exchanging professional knowledge. Once in two years navies from the Indian Ocean region meet at the Andaman and Nicobar Islands and the event is named as Milan. MILAN included a passage exercise in 2010. The Indian Navy regularly conducts adventure expeditions. The sailing ship and training vessel INS Tarangini began circumnavigating the world on 23 January 2003, intending to foster good relations with various other nations; she returned to India in May of the following year after visiting 36 ports in 18 nations. INS Tarangini returned to port, after a ten-month-long overseas voyage named Lokayan 07. Lt. Cdr. M.S. Kohli led the Indian Navy's first successful expedition to Mount Everest in 1965; the Navy's ensign was again flown atop Everest on 19 May 2004 by a similar expedition. Another Navy team also successfully scaled Everest from the north face, the technically more challenging route. The expedition was led by Cdr Satyabrata Dam, belonging to the elite submarine arm. Cdr. Dam is a mountaineer of international repute and has climbed many mountains including the Patagonias, the Alps among others. This team's record is unmatched by any other navy. The Navy was also the first to send a submariner to summit Everest. An Indian Navy team comprising 11 members successfully completed an expedition to the Arctic pole. To prepare, they first travelled to Iceland, where they attempted to summit a peak. The team next flew to eastern Greenland; in the Kulusuk and Angmassalik areas, they used Inuit boats to navigate the region's ice-choked fjords. They crossed northward across the Arctic Circle, reaching seventy degrees North on skis. The team scaled an unnamed peak of height 11,000 feet (3,400 m) and named it ‘’Indian Peak’’. The Indian Naval ensign first flew in Antarctica in 1981. The Indian Navy succeeded in Mission Dakshin Dhruv 2006 by traversing to the South Pole on skis. With this historic expedition, they have set the record for being the first military team to have successfully completed a ski traverse to the Geographic South Pole. Also, three of the ten member team – the expedition leader – Cdr. Satyabrata Dam, leading medical assistants Rakesh Kumar and Vikas Kumar are now among the few people in the world to have visited the two poles and summited Mt. Everest. Indian Navy became the first organisation to reach the poles and Mt. Everest. Cdr. Dilip Donde completed the first solo circumnavigation by an Indian citizen on 22 May 2010. By the end of the 14th Plan (2019), the Indian Navy expects to have over 150 ships and close to 500 aircraft and helicopters. In addition to the existing mission of securing both sea flanks in the Bay of Bengal and the Arabian sea, the navy would be able to respond to emergency situations far away from the main land. Marine assault capabilities will be beefed-up by setting up a new amphibious warfare facility at Kakinada, Andhra Pradesh. The Indian Navy has initiated Phase II expansion of INS Kadamba, the third largest naval base, near Karwar. Phase II will involve expansion of the berthing facilities to accommodate 40 more front-line warships, including the aircraft carrier INS Vikramaditya, raise manpower to 300 officers and around 2,500 sailors, and build a naval air station with a 6,000-foot runway. This is to be followed by Phase IIA and IIB, at the end of which INS Kadamba will be able to base 50 front-line warships. The Indian Navy is also in the process of constructing a new naval base, INS Varsha, at Rambilli for its Arihant Class submarines. India plans to construct a pair of aircraft carriers, the first to be built by a South Asian country. The first, INS Vikrant, was launched in 2013 by Cochin Shipyard and undocked in June 2015. It is expected to be completed by 2017 and undergo extensive sea trials thereafter with commissioning planned for 2018. Vikrant displaces 40,000 tonnes and will be capable of operating up to 40 aircraft, including 30 HAL Tejas and MiG-29K fighters. The second ship, INS Vishal (formerly known as Indigenous Aircraft Carrier-II), will displace around 65,000 tonnes and is expected to be delivered to the Indian Navy by 2025. With the future delivery of Vishal, the Navy's goal to have three aircraft carriers in service, with two fully operational carriers and the third in refit, will be achieved. In addition to aircraft carriers and large amphibious assault ships, the Indian Navy is acquiring numerous surface combatants such as; the Visakhapatnam-class destroyers, the Project 17A-class frigates, ASW shallow water corvettes, ASuW corvettes and MCM vessels. New submarine types include; the conventional Kalvari-class, Project 75I and the nuclear Arihant-class. New auxiliary ships include; five Replenishment Oilers, a Missile Range Instrumentation Ship and an Ocean Surveillance Ship. Accidents in the Indian navy have been attributed to ageing ships in need of maintenance, delayed acquisitions by the Ministry of Defence, and human error. However naval commentators also argue that as India's large navy of 160 ships clocks around 12,000 ship-days at sea every year, in varied waters and weather, some incidents are inevitable. Captains of erring ships are dismissed from their command following an enquiry. The accident on board INS Sindhuratna (S59) led to the resignation of the then Chief of Naval Staff (CNS) Admiral D K Joshi on 26 February 2014, who owned moral responsibility. The navy is envisaging a new 'Safety Organisation' to improve safety of its warships, nuclear submarines and aircraft in view of its planned increase in fleet strength over the next decade. The Indian Navy from 1950 to 2001 used a modified version of the British Naval jack, with the Union flag replaced with the Indian Tricolor in the canton. In 2001, this flag was replaced with a white ensign bearing the Indian Navy crest, as the previous ensign was thought to reflect India's colonial past. However complaints arose that the new ensign was indistinguishable as the blue of the naval crest easily merged with the sky and the ocean. Hence in 2004, the ensign was changed back to the St. George's cross design, with the addition of the emblem of India in the intersection of the cross. In 2014, the ensign as well as the naval crest was further modified to include the Devanagari script: सत्यमेव जयते (Satyameva Jayate) which means 'Truth Alone Triumphs' in Sanskrit. 1 2 "Press Information Bureau". Retrieved 16 September 2016. ↑ John Pike. "India - Navy". ↑ Setumadhavarao S. Pagadi., Setumadhavarao S (1993). Shivaji. National Book Trust. p. 21. ISBN 81-237-0647-2. ↑ 300th Anniversary of Coronation of Chatrapati Shivaji Maharaj. ↑ Veena Sheshadri (22 October 2013). India: A to Z. Penguin Books Limited. pp. 22–. ISBN 978-93-5118-426-3. ↑ Preston, Antony; Jordan, John; Dent, Stephen (2007). Warships. London: Conway Maritime Press. p. 164. ISBN 1844860418. 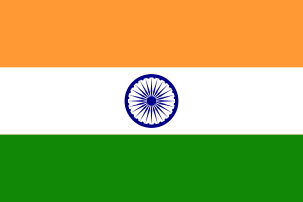 ↑ Interesting facts about India Archived 6 December 2007 at the Wayback Machine. ↑ Maritime trade with the west Archived 11 June 2008 at the Wayback Machine. ↑ Economics Of The Indus Valley Civilisation. Csuchico.edu. Retrieved 6 January 2012. Archived 26 December 2007 at the Wayback Machine. ↑ How to Build a Dock. Monsterguide.net (15 June 2009). Retrieved 6 January 2012. ↑ SOUTH ASIA | Indian seabed hides ancient remains. BBC News (22 May 2001). Retrieved 6 January 2012. ↑ Indian Naval-Early History. Indiannavy.nic.in. Retrieved 6 January 2012. Archived 3 September 2006 at the Wayback Machine. ↑ Bharat Rakshak :: Land Forces Site - The Maratha Light Infantry Archived 4 November 2012 at the Wayback Machine. ↑ "The Second World War in the Mediterranean, North Africa and Italy". wewerethere.mod.uk. Archived from the original on 24 January 2008. Retrieved 4 August 2016. ↑ Goa Operation. Indian Navy. Retrieved 6 January 2012. Archived 5 September 2005 at the Wayback Machine. ↑ Gopal, B. Madhu (2 December 2006). "Metro Plus Visakhapatnam : Remembering our war heroes". The Hindu. Chennai, India. Retrieved 11 June 2010. ↑ "Does the US want war with India?". rediff.com. 22 January 2007. Retrieved 11 June 2010. ↑ Hiranandani, G M. Transition to Triumph: Indian Navy 1965–1975. ISBN 1-897829-72-8. ↑ "Pakistan Navy". battleships-cruisers.co.uk. Retrieved 6 January 2012. ↑ Commander (Retd) Muhammad Azam Khan. "Maritime Awareness and Pakistan Navy". Defence Journal. Retrieved 16 May 2005. ↑ "Items in India/Pakistan/Bangladesh – Report of the high level consultants mission to Bangladesh" (PDF). United Nations. Archived from the original (PDF) on 28 July 2011. Retrieved 26 July 2011. ↑ "Cold War Games". bharat-rakshak.com. 12 December 1971. Archived from the original on 15 September 2006. Retrieved 6 January 2012. ↑ "Bangladesh: Out of War, a Nation Is Born". Time. 20 December 1971. (subscription required (help)). ↑ "The Bangladesh war". Encyclopædia Britannica. Retrieved 4 August 2016. ↑ "The courage to say NO!". rediff.com. April 2003. Retrieved 6 January 2012. ↑ Brewster, David. "India's Ocean: the Story of India's Bid for Regional Leadership". Retrieved 13 August 2014. ↑ Brewster, David; Rai, Ranjit. "Flowers Are Blooming: the story of the India Navy's secret operation in the Seychelles". Retrieved 10 August 2014. ↑ "Operation Cactus". bharat-rakshak.com. Archived from the original on 3 December 2008. Retrieved 4 August 2016. ↑ "Operation Cactus – Indian Navy". Armedforces.nic.in. 3 November 1988. Archived from the original on 15 April 2010. Retrieved 16 July 2010. ↑ Mehta, Ashok K (December 2000). "India's national interest had been made coterminus with maritime security". rediff.com. Retrieved 6 January 2012. ↑ Pike, John. "1999 Kargil Conflict". Globalsecurity.org. Retrieved 16 July 2010. ↑ Parekh, Shyam (30 November 2005). "Indian Navy celebrates its silent Kargil victory". Daily News and Analysis. Retrieved 6 January 2012. ↑ "Ministry of Defence Report" (PDF). Archived from the original (PDF) on 22 March 2012. Retrieved 6 January 2012. ↑ "Indian Navy's Vision" (PDF). Indian Navy. Archived from the original (PDF) on 16 December 2010. Retrieved 3 August 2011. ↑ "Bharat Rakshak Monitor – Volume 6(1) Jul–Aug 2003". Bharat-rakshak.com. Archived from the original on 13 April 2009. Retrieved 16 July 2010. ↑ "President Discusses Strong U.S.-India Partnership in New Delhi, India". The White House. 3 March 2006. 1 2 "Tsunami diplomacy improves India's global image". Expressindia. 9 February 2005. Archived from the original on 6 May 2005. ↑ Sakhuja, Vijay (8 February 2005). "Indian Naval Diplomacy: Post Tsunami". Institute of Peace and Conflict Studies. Archived from the original on 8 January 2009. ↑ Giridharadas, Anand (22 September 2008). "India is projecting its military power". International Herald Tribune. Archived from the original on 25 September 2008. Retrieved 6 January 2012. ↑ "National : INS Jalashwa joins Eastern Fleet". The Hindu. Chennai, India. 14 September 2007. Retrieved 16 July 2010. ↑ "INS Jalashwa joins Eastern Fleet". The Hindu. 14 September 2007. Retrieved 6 January 2012. ↑ "Operation Sukoon for the evacuation of Indian Nationals from Lebanon Lok Sabha" (Press release). Ministry of Defence. 29 July 2006. Retrieved 6 January 2012. ↑ "'Op Sukoon' - Making 'Sweet Music': 24 July 2006" (PDF). Archived from the original (PDF) on 1 July 2007. Retrieved 6 January 2012. ↑ "Indian Navy Doctors Serve on U.S. Navy Hospital Ship Mercy's Aid Mission in South and Southeast Asia" (Press release). Embassy of the United States New Delhi India. 7 September 2006. Archived from the original on 22 September 2006. ↑ "India sends rice for Bangladesh storm victims". Reuters. 8 December 2007. Retrieved 6 January 2012. ↑ "India sends food for Nargis survivors". Business Standard. 12 May 2008. Retrieved 16 July 2010. ↑ "Myanmar: India's assistance to Myanmar must reflect its regional role". Reliefweb. 7 May 2008. Retrieved 6 January 2012. ↑ "The great Yemen escape: Operation Rahat by numbers". The Hindu. 14 April 2015. Retrieved 4 August 2016. ↑ "Navy, Coast Guard nab pirates, rescue hijacked merchant vessel off Goa coast". Indian Express. 17 November 1999. Archived from the original on 14 January 2012. Retrieved 6 January 2012. ↑ Biswas, Soutik (19 November 2008). "How sea piracy is hurting India". BBC News. Retrieved 6 January 2012. ↑ "India 'to step up piracy battle'". BBC News. 21 November 2008. Retrieved 5 May 2010. ↑ Aneja, Atul (20 November 2008). "Indian Navy destroys pirate ship in Gulf of Aden". The Hindu. Retrieved 6 January 2012. ↑ "Apprehension of Pirate Vessel". Pib.nic.in. (Press release). Ministry of Defence. 13 December 2008. Archived from the original on 20 December 2008. Retrieved 6 January 2012. ↑ "Indian Navy foils pirates' bid to attack Greek vessel". The Hindu. 19 July 2011. Retrieved 6 January 2012. ↑ "Press Information Over Thousand Ships Safely Escorted Across Gulf of Aden by Indian Navy". Pib.nic.in. (Press release). Ministry of Defence. 18 June 2010. Archived from the original on 7 January 2016. Retrieved 6 January 2012. ↑ "India 'sinks Somali pirate ship'". BBC News. 19 November 2008. Retrieved 5 May 2010. ↑ Pubby, Manu (20 April 2009). "Navy responds to SOS from Seychelles". Indian Express. Retrieved 6 January 2012. ↑ "Indian navy foils pirate attack in Gulf of Aden". Google.com. AFP. 29 May 2009. Archived from the original on 20 October 2010. Retrieved 6 January 2012. ↑ "Indian Navy ship foils piracy bid near Seychelles, nine arrested". Yahoo News. Indo Asian News Service. 28 April 2009. Archived from the original on 30 April 2009. ↑ "India pushes back on Somali pirates' new 'mother ship' offensive". The Christian Science Monitor. 7 February 2011. Retrieved 6 January 2012. ↑ "Pirate Mother Ship Prantalay Sinks off Lakshadweep during Anti Piracy Operations by India". Marinebuzz.com. 30 January 2011. Retrieved 6 January 2012. ↑ Singh, Divyesh; Sharma, Suman (14 March 2011). "Indian Navy captures 61 pirates, rescues 13 sailors". Daily News and Analysis. Retrieved 6 January 2012. ↑ "Indian navy captures 61 pirates". The Daily Breeze. The Associated Press. 9 March 2010. Retrieved 6 January 2012. ↑ "Fears for 18 as Indian navy submarine explodes and sinks in Mumbai". The Guardian. 14 August 2013. Archived from the original on 14 August 2013. Retrieved 14 August 2013. ↑ Pandit, Rajat (19 April 2016). "Navy plane thwarts piracy bid in Arabian Sea". The Times of India. Retrieved 4 August 2016. ↑ Prakash, Admiral Arun. (November 2005). Indian Navy "Shaping India's Maritime Strategy – Opportunities & Challenges". Speech delivered as Chief of the Naval Staff (India) at the National Defence College, India. Indian Navy. Retrieved 26 April 2012. Archived 24 August 2006 at the Wayback Machine. ↑ "Flag Officers - At the Helm". Indian Navy. Retrieved 13 September 2015. 1 2 "Naval Organisation". Indian Navy. Govt.. of India. Retrieved 7 October 2015. ↑ "Chief of the Naval Staff (CNS) | Indian Navy". indiannavy.nic.in. Retrieved 1 June 2016. ↑ "Vice Chief of Naval Staff (VCNS) | Indian Navy". indiannavy.nic.in. Retrieved 1 June 2016. ↑ 27 May 2016. "Top level appointments made in Indian Navy". NewsX. Retrieved 3 June 2016. ↑ "Chief of Personnel (COP) | Indian Navy". indiannavy.nic.in. Retrieved 1 June 2016. ↑ "Chief of Materiel (COM) | Indian Navy". indiannavy.nic.in. Retrieved 1 June 2016. ↑ "Director General Medical Services (Navy) | Indian Navy". indiannavy.nic.in. Retrieved 1 June 2016. ↑ "Director General Naval Design | Indian Navy". indiannavy.nic.in. Retrieved 21 June 2016. ↑ "SpokespersonNavy on Twitter". Twitter. Retrieved 2016-10-17. ↑ "SpokespersonNavy on Twitter". Twitter. Retrieved 2016-11-04. ↑ "Vice Admiral SR Sarma, AVSM, VSM, takes over as Director General Naval Project | Indian Navy". www.indiannavy.nic.in. Retrieved 2016-11-04. ↑ India, Press Trust of (2016-11-01). "Vice Admiral SR Sarma takes charge as DGNP, Vizag". Business Standard India. Retrieved 2016-11-04. ↑ "SpokespersonNavy on Twitter". Twitter. Retrieved 2016-10-21. ↑ "Press Information Bureau". Retrieved 2016-10-24. ↑ "Girish Luthra takes charge of WNC". ↑ "Flag Officer Commanding in Chief, Eastern Naval Command | Indian Navy". indiannavy.nic.in. Retrieved 1 June 2016. ↑ "Vice Admiral AR Karve takes charge of Southern Naval Command | Latest News & Updates at Daily News & Analysis". dna. 29 May 2016. Retrieved 30 May 2016. ↑ "INS Kadamba". Indian Navy. Archived from the original on 8 December 2011. Retrieved 4 January 2012. ↑ "India set to drop anchor off China". Deccan Chronicle. 26 June 2011. Archived from the original on 27 August 2011. Retrieved 6 January 2012. ↑ "INS Kattabomman". Indian Navy. Retrieved 6 May 2015. ↑ "Sino India rivalry in Indian ocean". ↑ "Listening station in Oman". ↑ "रक्षा मंत्री ने कारवाड़ में आईएनएस वज्रकोष को राष्ट्र को समर्पित किया". पत्र सूचना कार्यालय, भारत सरकार. 9 September 2015. Retrieved 22 September 2015. ↑ "Naval Academy at Ezhimala of Indian Navy is the Largest in Asia". Retrieved 31 May 2015. ↑ "Order of Battle - India". milaviapress.com. Retrieved 6 January 2012. ↑ Kumar, Vinay (1 August 2012). "Naval air station opened in Campbell Bay". The Hindu. Chennai, India. ↑ National : Navy's Marine Commandos steal the show. The Hindu (2 May 2007). Retrieved 6 January 2012. ↑ "Indian Carrier Sails from Russia for Final Sea Trials". defencetalk.com. 8 July 2013. Retrieved 4 August 2016. ↑ Waldron, Greg (31 January 2013). "India's Vikramaditya to undergo final trials in mid-2013". FlightGlobal.com. Retrieved 4 August 2016. ↑ "Navy to build four amphibious warships". Indian Express. 13 December 2009. Archived from the original on 28 February 2010. Retrieved 6 January 2012. ↑ Gangadharan, Surya (20 December 2011). "Indian Navy developing new stealth ships].". Ibnlive.in.com. Archived from the original on 7 January 2012. Retrieved 6 January 2012. ↑ Prasad, K.V. (20 December 2011). "President reviews Navy's might". The Hindu. Retrieved 6 January 2012. ↑ "Akula-class submarine / Bars-class / Project 971". globalsecurity.org. 4 August 2009. Retrieved 6 January 2012. ↑ Sen, Sudhi Ranjan (16 December 2014). "India to Lease a Second Nuclear Submarine From Russia". NDTV. Retrieved 5 August 2016. ↑ "India rejoins the nuclear submarine league". UPI.com. 5 January 2012. Retrieved 6 January 2012. ↑ Sharma, Shuman (12 June 2010). "Navy creating a new base for nuke submarines". Daily News and Analysis. Retrieved 6 January 2012. ↑ Pandit, Rajat (17 July 2009). "India set to launch nuclear-powered submarine". The Times of India. New Delhi. Retrieved 11 June 2010. ↑ "Ship 'Kochi' to be commissioned in Indian Navy on 30 Sep 15". indiannavy.nic.in. Retrieved 5 August 2016. ↑ "Brahmos naval version tested successfully". Pib.nic.in. Ministry of Defence. 5 March 2008. Archived from the original on 24 September 2010. Retrieved 6 January 2012. ↑ Mathews, Neelam (23 August 2013). "Indian Navy Requests New Patrol Aircraft". ainonline.com. Retrieved 30 September 2013. ↑ "Air Defense: Barak Gets Bigger And Better". strategypage.com. 7 August 2013. Retrieved 30 September 2013. ↑ Mallikarjun, Y. (5 October 2012). "Nuclear-capable Dhanush successfully test-fired". The Hindu. Chennai, India. Retrieved 3 October 2013. ↑ The Hindu : National : Navy building high-speed data network. Hinduonnet.com (6 December 2004). Retrieved 6 January 2012. ↑ "Indian Navy to create cyber cadre". The Times of India. 13 July 2012. Archived from the original on 13 July 2012. ↑ "PFR 2006". Indiannavy.nic.in. Archived from the original on 6 July 2006. Retrieved 6 January 2012. ↑ "President Pratibha Patil sails in warship, reviews naval fleet". The Times of India. 20 December 2011. Retrieved 6 January 2012. ↑ Madhusoodanan, R. "Building Bridges of Friendship". mod.nic.in. Archived from the original on 11 April 2009. ↑ Simbex-2009. Ministry of Defence. Pib.nic.in (2 April 2009). Retrieved 6 January 2012. ↑ Indian warships to exercise with Brasil, S Africa. Hindustan Times (11 August 2010). Retrieved 6 January 2012. Archived 31 August 2010 at the Wayback Machine. ↑ India to take part in China's International Fleet Review. The Hindu. (20 March 2009). Retrieved 6 January 2012. Archived 16 November 2010 at the Wayback Machine. ↑ Eye on China, India and Japan ink security pact. Indian Express (23 October 2008). Retrieved 6 January 2012. ↑ "Two Indian naval ships dock in Sai Gon Port for 5-day visit". Archived from the original on 12 June 2008. Retrieved 26 November 2014. 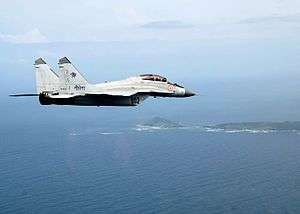 ↑ Indian Navy engages US and Russia away from home. Ministry of Defence. Pib.nic.in. 29 March 2007. Retrieved 6 January 2012. 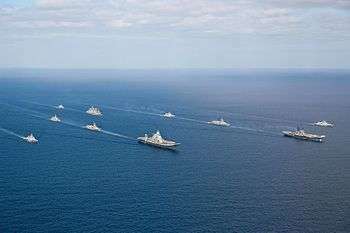 ↑ India, S Korea to hold joint naval exercise. Outlookindia.com. 31 May 2007. Retrieved 6 January 2012. ↑ "Indian Navy to participate in South Korean international fleet review". Thaindian.com. 20 August 2008. Retrieved 16 July 2010. ↑ National : Indo-German naval exercises to begin today. The Hindu (8 April 2008). Retrieved 6 January 2012. 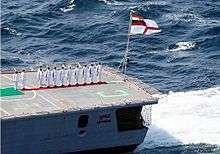 ↑ Abu Dhabi: Indian naval ships attract visitors. Mangalorean.Com. 3 April 2009. Retrieved 6 January 2012. Archived 2 April 2009 at the Wayback Machine. ↑ Naval flotilla to hold exercises with Persian Gulf states. The Hindu. (31 July 2007). Retrieved 6 January 2012. Archived 30 September 2007 at the Wayback Machine. ↑ International / India & World : India ready for naval exercises with GCC countries. The Hindu (23 December 2007). Retrieved 6 January 2012. ↑ IONS-Official website. Indiannavy.nic.in (15 February 2008). Retrieved 6 January 2012. Archived 10 February 2008 at the Wayback Machine. ↑ "PM calls on Indian Ocean navies to pool resources". The Times of India. (15 February 2008). Retrieved 6 January 2012. ↑ Indian navy's role in international diplomacy increasing Archived 27 September 2007 at the Wayback Machine. ↑ WHAT. Indiadefence.com. Retrieved 6 January 2012. ↑ Indian naval ships coming on courtesy tour. Gulf Times. 24 July 2007. Retrieved 6 January 2012. Archived 9 December 2007 at the Wayback Machine. ↑ Navy war games with French, British in Atlantic next month. The Hindu. (29 May 2009). Retrieved 6 January 2012. Archived 1 June 2009 at the Wayback Machine. ↑ Indian Navy validates new maritime warfare doctrine. India eNews (26 February 2007). Retrieved 6 January 2012. ↑ Indian Navy begins TROPEX 2010. Frontier India (25 February 2010). Retrieved 6 January 2012. ↑ Ladwig, Walter. (9 June 2010) Walter Ladwig: India Sets Sail for Leadership. The Wall Street Journal. Retrieved 6 January 2012. ↑ Sri Lanka-India joint Naval exercise begins. Hindustan Times (19 September 2011). Retrieved 6 January 2012. Archived 28 October 2011 at the Wayback Machine. ↑ PM's Day at Sea Indian Navy Displays its Blue-Water Capabilities. Mod.nic.in. 15 May 2006. Retrieved 6 January 2012. ↑ The Hindu : News / National : Milan exercise concludes with passage exercise. The Hindu. (9 February 2010). Retrieved 6 January 2012. 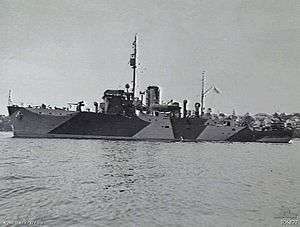 ↑ Ins Tarangini. Indian Navy. Retrieved 6 January 2012. Archived 1 September 2006 at the Wayback Machine. ↑ A ship sails tall and proud. The Hindu (30 October 2007). Retrieved 6 January 2012. ↑ India Navy Summits Everest :2004 Expedition. Everestnews2004.com (19 May 2004). Retrieved 6 January 2012. ↑ India Navy North Side Everest 2004 Expedition Team. Everestnews2004.com. Retrieved 6 January 2012. 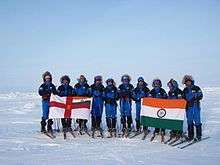 ↑ Press Information Indian Navy North Pole Team Creates Record. Ministry of Defence. Pib.nic.in (9 April 2008). Retrieved 6 January 2012. ↑ Dilip Donde completes first solo circumnavigation for India. Sail-World.com. 22 May 2010. Retrieved 6 January 2012. Archived 18 January 2012 at the Wayback Machine. ↑ Indian commander celebrates 60th Republic Day in the Falklands – MercoPress. En.mercopress.com (26 January 2010). Retrieved 6 January 2012. ↑ Brand new Indian Navy with long legs by 2027: Admiral Verma IBNLive.in.com. 3 December 2011. ↑ Diplomat, Saurav Jha, The. "India's Undersea Deterrent". Retrieved 27 September 2016. ↑ Bhat, Aditya. "Indian Navy targets to induct indigenously built aircraft carrier by 2018". Retrieved 27 September 2016. ↑ "India to launch aircraft carrier INS Vikrant today". The Times of India. 12 August 2013. Retrieved 12 August 2013. ↑ Pandit, Rajat (8 January 2007). "Carrier battle groups will add muscle to Navy power". The Times of India. On Board INS Viraat (Arabian Sea). Retrieved 11 June 2010. ↑ "Indian Navy launches Request For Proposal for 4 amphibious vessels (LHD type)". 23 November 2011. Retrieved 10 August 2014. ↑ "Indian Navy's dubious safety record worrisome for national security". Retrieved 26 November 2014. ↑ Shukla, Ajai (6 March 2014). "The sinking feeling over Indian navy". Aljazeera. Retrieved 18 April 2014. ↑ "Tale of an underwater tragedy". Business Standard. 5 March 2014. Retrieved 18 April 2014. ↑ "Navy sacks INS Airavat captain after warship mishap". The Times of India. 4 February 2014. Retrieved 18 April 2014. ↑ "Indian Navy strips top officers of warship command over lapses, accidents". Hindustan Times. 25 January 2014. Retrieved 18 April 2014. ↑ "Admiral Joshi Resigns.". The Times of India. Retrieved 26 February 2014. ↑ "New Safety Organisation Envisaged For Indian Navy". Retrieved 26 November 2014. ↑ "Indian Navy to change its ensign". Retrieved 10 April 2015. ↑ "Indian Navy to launch Satyameva Jayate credo with a new logo". Retrieved 10 April 2015. Rear Admiral Satyindra Singh (1986). Under Two Ensigns: The Indian Navy 1945-1950. India: Oxford & IBH Pub. Co. ISBN 81-20400-94-1. Rahul Roy-Chaudhury (2000). India's Maritime Security. India: Institute for Defence Studies and Analyses. ISBN 81-86019-29-4. 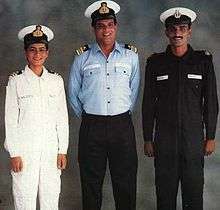 Indian Navy's Southern Naval Command (2005). A Shared Destiny: The Indian Navy and the City of Kochi. Kochi: Headquarters of Southern Naval Command. OCLC 70335840. Goldrick, James (1997). No Easy Answers: The Development of the Navies of India, Pakistan, Bangladesh, and Sri Lanka, 1945–1996. Lancer Publishers. ISBN 1-897829-02-7. Ladwig III, Walter C. (2012). Drivers of Indian Naval Expansion, (PDF). in Harsh V. Pant, (ed.) The Rise of the Indian Navy: Internal Vulnerabilities, External Challenges. Ashgate. Vice Admiral Mihir K. Roy (1995). War in the Indian Ocean. New Delhi: Lancer Publishers. ISBN 1-897829-11-6. Vice Admiral S. H. Sarma (2001). My Years at Sea. New Delhi: Lancer Publishers & Distributors. ISBN 81-7062-121-6.